Please note: This is an archived copy of a printed publication, provided for reference and context only. In the case of some articles, information and links (especially to non-UMass Web sites) may be out of date. OIT does not actively maintain these pages. Recording media for digital data are vulnerable to deterioration and catastrophic loss, and even under ideal conditions they are short lived relative to traditional hard copy format materials. Although we have been dealing with acid-based paper, fax paper, photo film and other fragile media for decades, the risks posed by magnetic and optical media are qualitatively different. They are the first reusable media and they can deteriorate fairly rapidly, making the time frame for decisions and actions to prevent loss a matter of years, not decades. In addition to the challenge of media deterioration is the problem of obsolescence in retrieval and playback technologies. Innovation in the computer hardware, storage, and software industries continues at a rapid pace, yielding greater storage and processing capacities at lower cost. Devices, processes, and software for recording and storing information are being replaced with new products and methods on a regular cycle, driven primarily by market forces. Records created in digital form are vulnerable to technological obsolescence. Even though some optical disk technologies promise life spans of up to 100 years, many authorities argue that enhanced media longevity is of questionable value because current media outlast the software and devices needed to read them. With moderate care, most magnetic media will last for 10 years. With special storage and handling, digital magnetic tape formats can reliably store information for 30 years or more. Optical disc media, such as CD-ROM and CD-R, can last for several decades. Testing by Imation/3M indicates that their CD media will last for over 100 years, although this figure should be viewed with at least a little skepticism. Research by Kodak also shows that CD-ROM media is estimated to last for over 100 years. 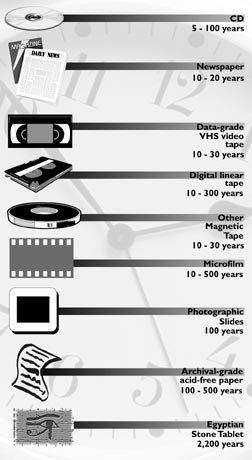 Older magneto-optical (M-O) and phase change (PD) media have a life expectancy comparable to magnetic media of 10 - 30 years. Life expectancy ratings when given for data storage media are similar to mile-per-gallon ratings for cars and trucks. What are the life expectancies of and optimum storage conditions for floppy disks? We know that floppy disks are not recommended for archival storage, but they are commonly used to store data from PCs. The materials used in the production of diskettes are very similar to those used for magnetic tapes. Therefore, the recommendations regarding the storage of magnetic tape also apply to diskettes. Tapes and diskettes both benefit from low storage temperature and humidity, cleanliness, and proper care and handling. However, compared to tapes, diskettes are much more susceptible to data loss via dirt and mishandling for the following reasons. Tapes implement an error correction code scheme; if data is missing on one portion of the tape, it may be able to be re-constructed from the redundant information written. Diskettes do NOT employ this scheme. If a data bit gets lost, there is no way to reconstruct it or recover it. Diskettes are more susceptible to dirt and mishandling than tapes. Tapes are contained in a durable cartridge with a door that makes it difficult to touch the surface of the tape. 5-1/4" diskettes had exposed media that was easily contaminated with fingerprints, scratched, or exposed to debris. 3-1/2" diskettes are more protected, but debris can still enter the case through the opening near the disk hub. Diskettes do not give you an indication as to when they are wearing out. You could write to a disk one day and be unable to read it on the next. On the other hand, some tape systems, such as DAT, will warn you when the media is wearing out, as indicated by excessive write errors. This gives you an opportunity to replace the old, worn out tape with a new one before files are irretrievably lost. If a disk is used daily, a backup of the disk should always be made on a regular basis. Debris and wear are the most common causes of information loss from a diskette. If debris gets under the head when the disk is being written, it will not be able to be read. If dirt or a fingerprint gets on the diskette it may not be readable. A scratch can remove material that contained a recorded "bit" of information making the diskette unreadable. If a disk is used every day, the magnetic coating will literally wear out over a period of time. Each time a diskette is read, a small amount of material is worn from the diskette. If enough material is worn from the diskette, the magnetic signal may not be strong enough for the diskette to be read. Furthermore, wear debris particles that are generated can interfere with the reading and writing of diskettes. The most convenient place to store magnetic media -- near a computer monitor or near speakers, on top of a desk -- is about the worst place to store it! The biggest external threats to magnetic media are strong magnetic fields from commonplace sources such as unshielded loudspeakers, computer monitors, windshield wiper motors, refrigerator doors, etc. These require near contact to effect immediate damage. However, even placement within a few inches can gradually degrade an unshielded disk or tape. Even in a pristine environment, magnetic media have a shelf life. Tapes are liable to magnetic print-through. All media, but especially tapes, are liable to the unavoidable chemical breakdown of long molecules and larger particles. The formulations that allow higher storage densities involve complex substrates, binders, particles, and lubricants. Complexity feeds entropy. Ample research and experience provide evidence of what can go wrong with magnetic media as a result of binder degradation, magnetic particle instabilities, and substrate deformation. Optical media are susceptible to damage from high humidity, rapid and extreme temperature fluctuations, and contamination from airborne particulate matter. To prevent these problems, it is very important to store magnetic and optical media under strict environmental controls that are not always available, affordable, or convenient. Even modest improvements which produce storage media with larger per unit storage capacities and greater tolerance to variations in temperature and humidity will lower preservation costs. This will be accomplished by lessening the need for strict environmental controls, reducing the frequency with which digital media must be "refreshed" through recopying, and decreasing the number of storage units that must be handled. The only magnetic reasons for an unsuccessful data recovery are erasure or extreme temperature exposure. The Curie temperature for 8mm Metal Particle DAT Tape is 1000C! Hence we need not be concerned about the magnetic properties because these temperatures will destroy the binder and the base film long before the magnetic properties are affected. The physical damage of the media is the most probable cause for unsuccessful recovery of shelf or archival storage information. This damage can be caused by equipment, environment, or mishandling. Contamination of the media is the second most probable cause. Contamination can pre-exist, originate, or be created during every phase of the storage process. However, it is reasonable to expect successful recorded archival data recovery after a storage period of more than ten years if reasonable diligence is applied throughout the storage process to physical handling, cleanliness, and storage environment. To ensure a storage period of more than 10 years, we recommend the following shelf or archival procedures. Steps to Ensure maximum media life? Maintain the operational and storage environment within the range of 17C (62F) to 20C (68F) with ideal being 18.3C (65F) at 40% R.H. Keep the environment constant. Storing media in such a cool, dry place can retard chemical breakdown. Storing media away from radiation, magnetic fields, and sunlight is also very important. The reason for keeping the storage environment and operational environment the same is to reduce the stress in the media during transfer from one to the other. Lack of cleanliness is the second most probable reason for archival recovery failure. The cleaner the better is true for both operation and storage areas. Do not permit smoking, eating or drinking in either area, and do not operate in an obviously dirty positive pressure area. Avoid paper dust. It is not a good idea to locate a media device near a printer or a copier. The unit used for recording archival data must be exceptionally clean and must be set up and tested to spec both electrically and mechanically. If it is not, it may contaminate the media, damage the media and/or record out of specification. If one or more of these conditions is permitted to occur, the probability of successful archival storage recovery greatly diminishes. Label media clearly. Be sure to include relevant information such as the recording device, the date, any parameter settings, error statistics, and log number for pertinent information. The media must always be stored in a storage container. It is an excellent practice to place the storage container in a polyethylene bag and seal it prior to long-term storage. Store the media on edge. Do not stack horizontally. Make certain that your environmental control system is reasonably fail safe. Constant environment control is more important than the absolute values. As with the recording environment, keep it constant! The closer to the ideal environment, the better the recovery results. Keep a storage log of all storage media, locations, contents, history, etc. It is recommended that tapes be exercised by running them at normal speed (not rewind) once every 12 months. This rewinding process will remove some of the stresses that may have built up in the tape during the storage interval. Tapes stored in high temperatures should be rewound more frequently. It is also recommended that a random sample of media from each archive be read annually and checked. Use the same criteria used for the recording unit for the selection of the recovery unit. Ensure it is to spec and clean. Stabilize your environment to ideal if possible and allow the media 24 hours to stabilize to the recovery environment before starting the procedure. Follow your normal read recovery procedures. Last revised: Thursday, 12 June, 2003. Copyright � 2003 University of Massachusetts Amherst. Report site problems to wwwdev@oit.umass.edu. This is an Official Page/Publication of the University of Massachusetts Amherst Campus Office of Information Technologies.